In this study, we report a 14-year-old female with primary multiple intraventricular hydatid cysts causing neurological manifestations. A 14-year-old female child, first issue of a nonconsanguineous marriage, was brought with a history of headache for 10 days and multiple episodes of nonbilious projectile vomiting and altered sensorium on the day of admission. History of contact with pet animal was not there. Birth, development, and immunization history was normal. On examination, patient was a febrile and drowsy. Heart rate – 55/min, respiratory rate – 18/min on room air, blood pressure – 110/80 mmHg. Eye examination showed bilateral papilledema. Central nervous system examination showed drossy, Glasgow Coma Scale – E3, V5, M5 Pupils were bilaterally equal and reacting to light. Cranial nerves were normal. Tone was normal, power was 4/5 in all four limbs, reflexes – brisk, plantars-upgoing, no meningeal signs. Child was admitted in Pediatric Intensive Care Unit with working diagnosis of meningoencephalitis or space-occupying lesion (SOL). Computed tomography (CT) brain was suggestive of cystic lesion in left lateral ventricle causing descending transtentorial herniation and midline shift of 12 mm. Magnetic resonance imaging (MRI) brain showed multicystic intraventricular nonenhancing lesions with trapped lateral ventricles suggesting intraventricular space occupying lesion. Ruptured intraventricular hydatid cyst. It also showed descending transtentorial herniation with compression of midbrain and midline shift of 16 mm to the left. The child was stabilized with intravenous (IV) fluids, hyperosmolar therapy, prophylactic anticonvulsant, and mechanical ventilation. IV antibiotics, IV dexamethasone, and oral albendazole were started. Decompressive craniectomy and cyst removal were done by neurosurgeon. Hemogram showed normocytic normochromic picture. Hemoglobin was 10 g/dl, blood bactec - no growth; serum electrolytes, liver function test, and renal function tests were within normal limits; ultrasonography abdomen was normal. Craniotomy was done – dura was tense. Corticectomy was done – temporal horn reached. Cysts were excised. Cysts appeared thin wall and contained clear fluid. All (total 30) cysts cleared from temporal and occipital region. Cyst and fluid specimen was sent to pathology and microbiology department for confirmation. Histopathology report of cyst confirmed the diagnosis of hydatid cyst [Figure 1] Cyst fluid wet mount showed plenty of brood capsules and protoscolices [Figure 2]. However, patient's serum was negative for Echinococcus IgG antibodies. Repeat MRI brain confirmed removal of all cysts with minimal periventricular ooze. Intraventricular drain was removed after 3 days. Repeat CT brain after 3 days showed no signs of hydrocephalus or raised intracranial pressure and sensorium improved. Hence, supportive therapy was gradually waned off. IV antibiotics were omitted after 5 days. Child was shifted to ward and continued on oral eptoin, albendazole, cefuroxime, and prednisolone. She developed left facial nerve palsy which showed spontaneous gradual improvement. Patient was later discharged and was told to continue eptoin for 3 months, albendazole for 6 months, and to omit steroids after 5 weeks. Hydatid cyst is a zoonotic disease caused by E. granulosus. Infection with the larval stage of the tapeworm causes hydatid cysts in humans. Hydatid disease is endemic in the sheep and cattle raising areas of the world. Although hydatid cysts are known commonly to affect liver and lungs, in 1%–2% of cases, it can also affect brain. Brain involvement is more commonly seen in children (50%–75%). CT scan, MRI is very useful investigations for clinical diagnosis. 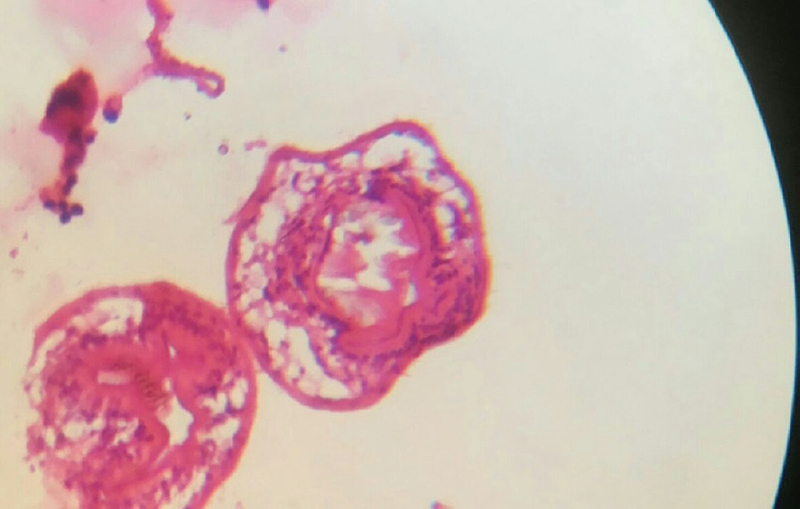 Brood capsules and protoscolices seen in histopathology slides and wet mount examination of fluids confirm the diagnosis. It also helps to differentiate cystic echinococcosis caused by E. granulosus from alveolar echinococcosis caused by Echinococcus multilocularis infection. Primary cysts in brain are usually solitary and are formed as a result of direct infestation of larvae in brain without the demonstrable involvement of other organs. Lack of effective immune system in brain, special architecture of brain tissue, patent ductus arteriosus, and patent foramen ovale have been proposed risk factors for isolated cerebral hydatid cysts. Secondary cysts are multiple caused by accidental spillage during surgery, trauma, or even spontaneously. Secondary cysts are infertile and lack germinative layer and brood capsules. Multiple primary cysts in ventricle are extremely rare as multiple larvae directly invade the brain. Boujan and Jalal have reported primary multiple cysts in brain in a 10-year-old child. A total of 73 cysts were removed from his cerebrum. 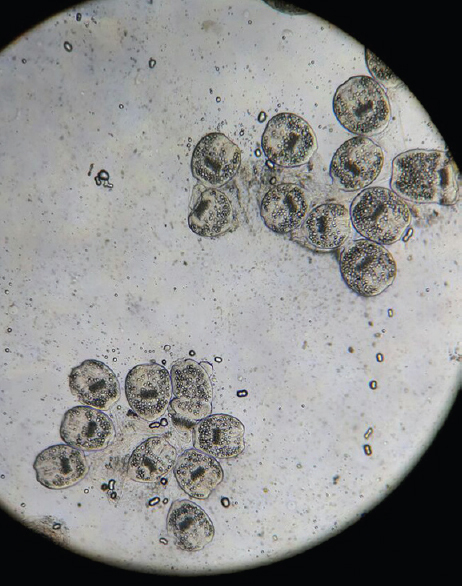 Popli and Khudale have also reported primary multiple hydatid cysts in a child in Australia. Gupta et al. have reported two cases of multiple hydatid cysts in the brain in Mumbai. Yüceer et al. have reported multiple hydatid cysts in brain. However, it was secondary due to surgical rupture of primary cyst. Intracranial hydatid cysts usually present as papilledema and symptoms due to SOL.,, Our patient also had papilledema and altered sensorium due to SOL. The best treatment is removal of hydatid cyst and oral administration of Albendazole. To avoid recurrences, albendazole is given for long duration. The incidence of primary multiple hydatid cysts of brain is very rare. In our case, larvae might have passed through the capillary filter of liver and lungs, entered systemic circulation, and reached brain. The aim is total removal of cyst and prevents recurrences. Nemati A, Kamagarpour A, Rashid M, Nazari S. Giant cerebral hydatid cyst in a child – A case report and review of literature. BJMP 2010;3:338. Kovoor JM, Thomas RD, Chandrashekhar HS, Jayakumar PN, Pillai S, Shankar SK, et al. Neurohydatidosis. Australas Radiol 2007;51:406-11. Tascu A, Ciurea AV, Vapor I, Brehar A. Giant asymptomatic intracranial hydatid cyst in a 3 years old child – Case report. Rom Neurosurg 2010;17:359-63. Ali M, Mahmood K, Khan P. Hydatid cysts of the brain. J Ayub Med Coll Abbottabad 2009;21:152-4. Yüceer N, Güven MB, Yilmaz H. Multiple hydatid cysts of the brain: A case report and review of the literature. Neurosurg Rev 1998;21:181-4. Bresson-Hadni S, Laplante JJ, Lenys D, Rohmer P, Gottstein B, Jacquier P, et al. Seroepidemiologic screening of Echinococcus multilocularis infection in a European area endemic for alveolar echinococcosis. Am J Trop Med Hyg 1994;51:837-46. Senapati SB, Parida DK, Pattajoshi AS, Gouda AK, Patnaik A. Primary hydatid cyst of brain: Two cases report. Asian J Neurosurg 2015;10:175-6. Boujan M, Jalal Z. A rare case of primary multiple hydatid cysts of brain in a 10 years old child. EMJH 2013;19:122-4. Popli MB, Khudale B. Primary multiple hydatid cysts of the brain. Australas Radiol 1998;42:90-1. Gupta S, Desai K, Goel A. Intracranial hydatid cyst; a report of 5 cases and review of literature. Neurol India 1999;47:214-7.